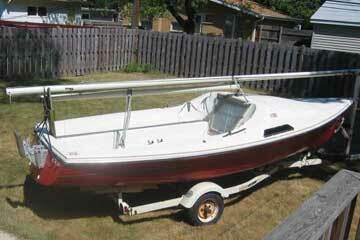 This boat needs TLC by somebody who enjoys fixing a sailboat. The boat was knocked down, broke off its centerboard and scratched the gelcoat. 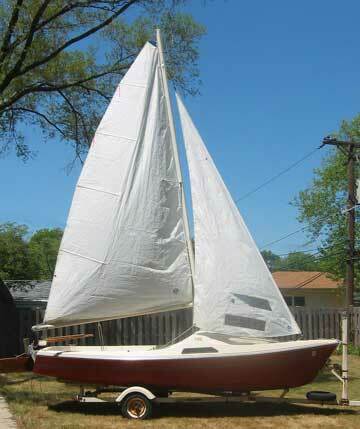 Purchaser will have to replace the centerboard and repair the gelcoat. Otherwise the boat is in good condition. New North sails were purchased in 1995 and used perhaps ten times. Sails are crisp and like new. The boat hasn't sailed for the last two years. The jib has a Harken roller furling for single handling with two windows. Cuddy cabin is carpeted. Added a tiller extension to improve boat control when heeling. All controls are run back to the cockpit. Comfortably holds four to six people. Easy to sail for the novice and experienced sailor as well. Caulkins trailer in good condition with buddy bearings, new carpeted rails, new spare tire. Outboard engine mount. Purchased by existing owner 1991.